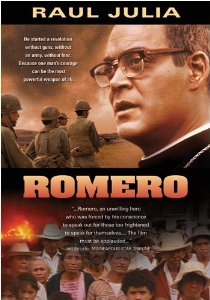 Romero is a biographical account of the last three years of Archbishop Oscar Adulfo Romero of El Salvador’s life. Beginning just before his appointment to Archbishop in 1977 and ending just after his death in 1980, the film traces the events that transformed this scholarly moderate, chosen for his ability to compromise, into a nonviolent revolutionary martyr for the human rights of El Salvador’s poor and oppressed. El Salvador, the smallest but most densely populated country in Central America, was ruled by a series of cruel military dictators for most of the 20th century. In the 1970s, as the oppression worsened and poverty and human rights abuses increased, many began to raise their voices against the violence and repression. Some of these voices came from the clergy of the Roman Catholic Church, the dominant religious group in Central and South America. Empowered by Liberation Theology, the belief that God sides with the poor and that Jesus is a prime model of both a spiritual and a political revolutionary, many priests began advocating for social reform and joining forces with poor and/or indigenous revolutionary groups. Bishop Romero was not among those voices until his dear friend, Father Rutilio Grande, was assassinated for his radical views and activities. From that point onward, Romero preached and worked for the rights of the poor and oppressed. The PG-13 rating is for violence. The U.S. has a long relationship with our southern neighbors in the Western Hemisphere, though little media attention is paid to their struggles. Learning about Latin American politics can help us understand the pain of oppression-oppression that U.S. foreign policy has played a part in-and the radical Liberation Theology that many contemporary U.S. theologians have drawn from in dealing with our own problems of poverty and human rights abuses. Primarily, however, it is important to learn about the peaceful, nonviolent movements that many Latin Americans were involved in, since U.S. media attention generally focuses on the violent “guerillas.” This film is a wonderful story of the power of love and nonviolence. After releasing his friend, Father Osuna, from the prison where he was tortured, Romero goes to visit President-Elect General Carlos Humberto Romero to discuss the repression of the church. The clip proceeds to Aguilares (where Father Rutilio Grande ministered until his assassination) and we witness the occupation of the town and the church and Bishop Romero’s courageous act of taking back the sanctuary. After Father Osuna is killed in prison, Bishop Romero visits Osuna’s closest friend, Father Morantes. Morantes is now carrying a gun, and he and Romero discuss the use of violence to affect change. This clip includes a montage of speeches, events and pictures depicting the politics of the rich, Romero’s ministry, pictures of the “Disappeared” political prisoners kidnapped and/or killed by the El Salvadoran government, and the plot to assassinate the Archbishop. The film ends shortly after his martyrdom. 1. Liberation theology has been accused of being revolutionary and of stirring people to violence. Though many believers in the theology of liberation waged nonviolent conflict, it is true that many guerilla fighters throughout Latin America have used the Hebrew prophets and the radical teachings of Jesus to justify their violence. Can revolutionary violence meant to liberate the oppressed be justified? What nonviolent means can be used to liberate the poor? 2. The U.S. has been criticized for its role in Latin American politics. Bishop Romero wrote to the President to ask him to stop sending arms to the El Salvadoran military, as they were only used to kill the oppressed people of the country. What can and/or should the U.S. military/government/people do to help the oppressed peoples of the world? 3. The church and the Eucharist (communion) are powerful themes and symbols throughout the film. Archbishop Romero and the people of Aguilares showed great courage in taking back their sanctuary at the risk of being fired upon. How powerful/meaningful are communities of faith in the U.S.? What spaces/institutions are meaningful to you? What would be important enough to you and from where would you draw the kind of courage it would take to walk unarmed into a line of armed men? 4. Romero believes-like most liberation theologians-that the church is the people and that its role is to side with the oppressed and to work for liberation. (See Matt. 5:1-12, Luke 1:52-53, and Luke 4:16-19) Do you agree? What do you see as the mission of the church? How can it live out this mission?